In all honesty there is nothing Italian at all about this salad, but the red, white and green vegetables reminded me of an Insalata Caprese and the colours of the Italian flag, and it looks pretty. 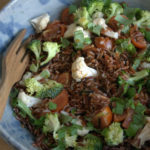 We needed a picnic supper tonight for a Scottish Dancing group that we go to and I found a bag of a mix of red camargue and wild rice in the cupboard and made a simple salad with some vegetables that I had in the fridge. As with my sunset salad vegetables are far easier to eat and enjoy raw if they are chopped into smaller pieces, if you prefer blanch the brocolli and cauliflower. I always cook my rice in a microwave steamer, I get perfect rice everytime and in about half the time it takes to cook on the hob – 14 minutes for brown rice and 11 for white, I cannot recommend them highly enough and would not be without mine. If you try this Red Rice and Italianesque Vegetable Salad please tag #FussFreeFlavours on Instagram or Twitter. It is amazing for me when for me when you make one of my recipes and I really do love to see them. You can also share it on my Facebook page. Please pin this recipe to Pinterest too! Thanks for reading Fuss Free Flavours! Simply cook the rice and dress with the olive oil, lemon juice and soy sauce (if using). When cold add the vegetables and basil and toss. Totally fuss free and delicious.